Con voi! I’m Esther, a Damanhur New Life participant from Spain. For three months, I shared all kinds of interesting and important life experiences here. I decided to do this program to better understand Damanhur, to experiment and experience myself living a different way of life than usual. The idea of ​​being more useful to the world and asking myself how to best serve others prompted me to make the decision and undertake this adventure. At the same time, I felt my heart fully open, full of love, wanting to give of myself, with a great desire to play with the unknown, with something different. As for language, it was clear which one was mine… the language of the heart! I’m so happy to have had this adventure! My relationship with nature, especially the trees. 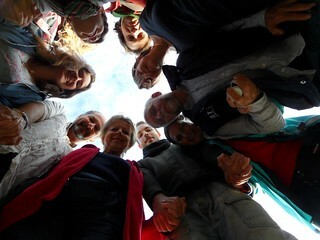 Working together with the New Life group and the kind of energy that was generated throughout our days. The meditations, doing seemingly hard work (at least for me), and creating a beautiful energy within me and also in the group. The great love that little by little grew toward each and every one of the New Life participants with whom I shared this experience. In the nucleo community Prima Stalla, I found a wonderful family that welcomed me. I feel bonds of respect and mutual love with all of them. I received so much and hope they understood everything I wanted to give to them. I had some “down” moments too: A feeling of emptiness, kind of like being on a roller coaster with my moods. In the end, I realized that everything was perfect and the circumstances were the rights ones for me to learn more lessons. I felt the presence of Falco in many moments and situations. I’m grateful for the New Life program. I palpably sense the opening of Damanhur and its people to the world. The mistakes that I perceived are much smaller than the immense energy that is the dream of the Damanhurian people. Speaking and most of all listening resolves everything. Thanks to all of you, for everything. I hope to be back soon!